Today is the first day back at work after the Easter break in England. April 2011 seems to have been one of the warmest on record. As we have been outside in our gardens all weekend with the barbecue roasting in the sun, it occurred to me to look seriously at building an outside wet area. Only a week ago I was reading two blogs – one by Andrew Dunning, a good friend and talented interior designer, the other by Karen Brimacombe from Reed Harris Tiles – both of them talking about taking the inside of the house outside with a seamless transition from the kitchen or lounge to a patio or tiled area. It’s going to be a hot summer, Fonte Dei Marmi do not just supply bathrooms, we work with clients from a concept, a request to design a functional yet beautiful Bathroom, Kitchen or both. Applying the design method to a garden what could we bring from inside the house to complement a summer barbecue? Over the years I have been fortunate enough to travel on many trips abroad, I have seen many weird, wacky and stunning homes with magical gardens, and often in countries with very different climates from our own. While visiting friends in Florida, Carribean, Maryland and the Mediterranean often visiting friends the oportunity to explore other peoples homes and gardens was really exciting and interesting. ; in each of those destinations the weather can be extremely hot, humid, and even uncomfortable. It is for those types of climate that we begin to get creative – the hotter it gets, the more we need to bathe, relax and freshen up, showering a priority. This Easter in England the temperatures have been exceptionally high, talk of global warming gathers momentum and I wished I had a swimming pool! Remember we are talking about Easter in the UK here and so far we have been to three barbecue events. In Karen from Reed Harris Tiles’s blog she mentioned the sunshine: how it makes us all feel happier and more alive, and how having a seamless transition from a tiled floor inside the house flowing out on to a patio can encourage us to spend more time outside in the summertime in an area of the house which is actually designed to be used, rather than not designed at all and left as an afterthought. Brilliant concept I say. Now the weather is hot, let’s explore the use of tiled areas just as we do in the bathroom to build a showering area for a hot afternoon or evening. Interestingly, outside we are not tethered to such dull constraints as four walls and a door, and that means we can create! A stone step to rest our feet while washing them or indeed a low wall with a recessed seat, an adjustable swivel shower head so one can lie in the sun while showering under cool rain! One material I love to work with is wood and bathrooms indoors present a huge challenge with all that water and damp air. We have talented carpenters and joiners capable of building marvellous wooden spiral staircases, bathroom cabinets and worktops yet so often we will opt for stone to match the floors. So if we are designing a shower for out in the garden we can perhaps look at raised decking as a platform for a standing shower area that can be lifted for cleaning access. I have often seen walls and standing areas made from Brighton beach pebbles set in cement. If a screen is required frosted safety glass can look attractive and lend some privacy. Choosing your shower and tiles is most important of course, the stone you use will determine how it will look when finished. Tiles must be anti-slip in my opinion with youngsters running about on lawns with wet feet – an outdoor shower is a great attraction for the children and the idea of walking into the shower at will is fabulous while working a hot barbecue. 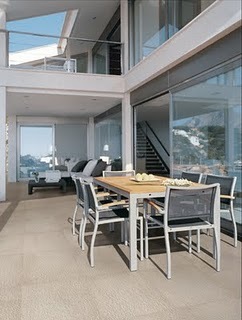 Marble is attractive but unless expensive grooves are to be cut by a fabricator a honed natural finish is a better bet. Crema Marfil or slate can look the part as in a garden often less is more – save the brighter colours for inside, maybe a splash of colour on a feature piece to draw attention but keeping it stylish. Blending the showering area with the natural colours of the garden can look very pleasing on the eye and classy at the same time. Natural stone, even granite can give you a superb outside finish with little or no real maintenance needed. Granite has a natural anti slip surface texture and has always been a favourite; I have used it on driveways, fireplace and outside steps as well as a kitchen floor in a barn conversion. Drainage is really very simple, again like inside the house a shower or drain gully with removable cleaning filter. A Harmer stainless steel strip will look good set in to Cornish granite or Welsh slate. McAlpine make some very attractive square and round drain gully designs, available from most plumbing trade merchants. 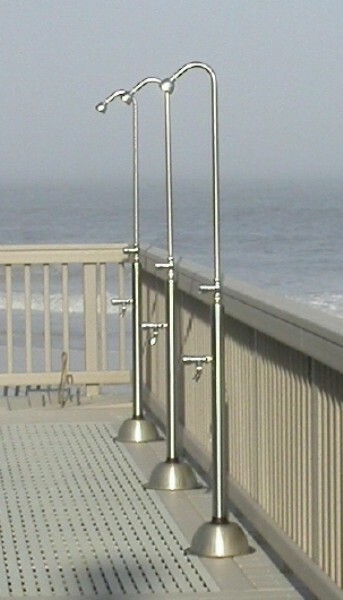 Beach Showers Courtesy Sterling Pool Co., Inc.
What shower do we use in a garden? In hot countries often one will see a shower pole standing every fifty metres along the seafront. Miami has many: Ocean Drive, where we lived for some years had very efficient, manually-controlled examples. It is so hot that you would only want cold water, so an on/off button suffices – great for rinsing sand off before going in the house – no need for thermostatic valves or really any temperature controls here. Remember, that the garden shower is really for use only on hot days. Thermostatic valves, handsets and hot water system are in your main, indoor bathroom for the year-round showering routine! 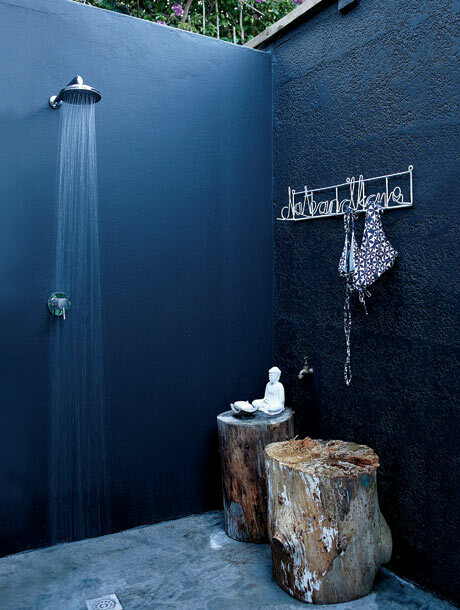 Installation of a garden shower is very simple. Think about how you water the flowers with a garden hose running from a bib tap with a wall mounted union. Using 15mm or 22mm Polypipe buried under the lawn is your alternative. Water pressure must be around a minimum1 BAR to supply a good spray. Depending on the budget copper pipes and compression fittings can be used but these days push fit systems are very common. Depending on the shower tower or pole you choose to buy you may need a pump installed in the house, near the garden to boost the pressure. Make sure you find out before buying anything, a little research will save you time and money. Remember as soon as you introduce a pump to the system electricity is required so safety and an electrician are to be considered. Building a garden shower is pretty simple compared to installing inside your home. Most importantly the water has to be taken away without seeping into the footings, causing any structural damage to property. Consulting a plumber and/or builder is a must though. Look around the garden and see where the house drains are located – water from the guttering will be a clue. A 40mm waste pipe with a minimum 4ofall on it will run waste shower water to this drain or away to another. Locations for any water feature or garden shower need to be thought out and planned very carefully: away from quiet areas for seating or the outside dining table. If you have children they will be in the shower non-stop, I know, so build it away from chill out zones and decking! Of course just like any bathroom at home you don’t need a massive area to have a shower. If you are pushed for space a 700mm x 700mm tray can be used and installed much like indoors except you won’t need any glass! Most of us are not lucky enough to have a swimming pool in the garden, yet a showering facility takes very little space and can be just the thing after gardening or a hot day in town. A fixed shower head can be fitted on to a wall for example or an exposed shower with a rigid riser used up from the ground so you need not hide any pipework. Again remember that water has to be drained, just because it’s outside does not mean it’ll magically disappear! Because of the possibility of soap and shampoo being used causing contamination it may not be re-cycled as grey water for the garden. Lighting can be great fun in gardens too, positioning spots and coloured LED’s under and at interesting plants and trees can be very relaxing as the Sun goes down during transition to nightfall. Soft lighting on running water is a favorite with me, the sounds of splashing water on stones cutting through that humidity! With any outside lighting systems, keep it simple with easy to understand switches installed by a lighting electrician. With the shower installad you’re all set for the hottest summer on record, I’m told Michael Fish the BBC weatherman will be cooling off in his garden shower and he’s always right! If your fortunate to have a reasonable size garden an outside shower can be a great way to keep the young family and their friends occupied while the food is being cooked on the barbecue and the papers read in peace. There are many shower towers on the market that are easily adaptable for installation outside, Grohe, Hansgrohe, Novellini and Vola are just four examples. As I finish writing this, the heat is rising in the London evening and I wish I could walk out under a cool shower, in my shorts! …Yes, don’t forget you have neighbours! 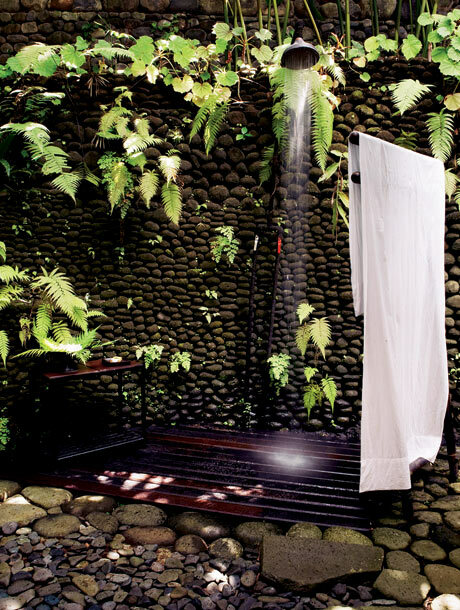 Remember, the design for your outside shower space is limited only by your imagination and practical issues combined. good post Tony! At this rate I will be designing outdoor kitchens and showers everyday if the weather keeps up! Thank you Francoise, I thought of you many times during the writing of this blog, wondering what you would think as a garden design expert. I will be calling on you to assist me with future outside/garden shower projects. We spend as much time as we can outside in the garden of our family home in the Cotswolds, I am just beginning a drawing of the shower for that garden. My mum looks worried her treasured Magnolia trees are safe, thats where Francoise comes in! Tony, Fonte Dei Marmi. What a great idea Tony – you’ve got us both thinking now!